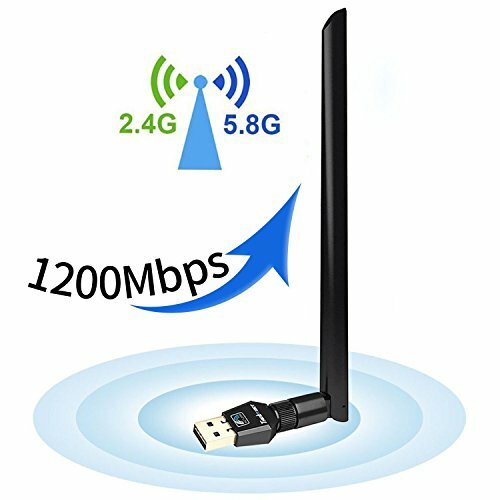 Wireless Usb Wifi Antenna，Wireless Network Adapter AC1200 Dual Band USB 3.0 5dBi 2.4G/300Mbps 5G/867Mbps, 1200Mbps Wireless USB Wifi Adapter for Win XP 7/8 / 8.1/10 Mac OS X 10.7-10.12.4 Linux by SPEEDY at AABX. MPN: 4335270515. Hurry! Limited time offer. Offer valid only while supplies last. Color:1200Mbps 5dBi with Antenna Network Wifi Antenna Dongle Adapter AC1200M Try 1200M dual band wifi dongle! Double faster than 600M wifi adapter! ★✔Max. Speed up to 2.4G/300Mbps 5G/867Mbps ✔ AC1200 Dual Band Wifi ✔ 5dBi ✔ Support Win XP 7 /8 / 8.1 /10 Mac OS X 10.7-10.12.4 above Linux✔ Support Desktop PC Laptop✔ Pair with any MU-MIMO, 11ac Wave 2 MU-MIMO✔WPS function for ONE-click easy wireless connection✔ Support by all WLAN routers ✔Feature 64/128-bit WEP,WPA&WPA2 encryption for high level of secure✔ Ultra-fast AC1200 wireless adapter speed with 802.11ac. ★ Easy Use & Easy Installation: Setup CD included, once you've run the software, you can simply insert the wireless usb wifi antenna to get connected. Attention: No drivers required for Windows 10, just plug and play. The indicator light is flashing means works well. Wifi network dongle AC1200Mbps with lifetime warranty is easy to install through CD. Comes with any pre-sale or after-sale services, lifetime tech support available. Just feel free to contact us if you have any problems. ★WPS ONE-click Encryption & Wi-Fi Hot Spot- WPS✔ not only free you from remembering long passwords but also guarantee network security. User-friendly setup and hassle-free configuration. No worry about jamming. Wi-Fi Hot Spot ✔You can create a Hot spot with the Soft AP Feature if your computer is under wired Internet connection. You can boost Wi-Fi to your mobile devices from your computer. ★ High Performance Wifi Antenna- Wieless Usb Wifi Antenna 360°omnidirectional high gain antenna guarantees high RF power (16DBm on 2.4GHz & 13DBm on 5GHz), allowing you to pick up wireless signals from long distance. Flexible antenna and Beamforming+ technology help boost speed, range and reliability. Enjoy the powerful internet connection, no worry about far from the router. ★High Transmission Speed - Wieless Usb Wifi is undisturbed by other normally interfering devices like Bluetooth or cordless phones. Which means you won't have unexpected dropped calls or loss of signal quality period. Wifi adapter with detachable 5dbi high gain long-range antenna make the signal stronger and through-wall to help you connect even when signals are weak. Up to 300Mbps 802.11n or 867Mbps 802.11AC, this usb wifi antenna is guaranteed to get you Faster speeds. If you have any questions about this product by SPEEDY, contact us by completing and submitting the form below. If you are looking for a specif part number, please include it with your message.